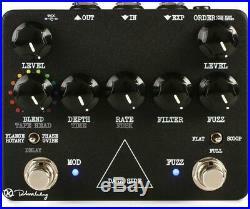 Keeley Dark Side Fuzz Delay Modulation David Gilmour Pedal V2 B-Stock. We have a special offer of a limited quantity of B-Stock pedals. These are cosmetic blemishes and in no way hinder the great product Keeley puts out. Robert just has very high standards. Act fast and get it while you can. Blems may vary - we are not taking pictures of individual pedals, but pictured here is one example of one - they blems are generally quite minor. We should all be so lucky as to be identified by the sound of a single note. Some players are so well defined that their entire musical journey can be heard in a single note they play. Tone is in the fingers. Tone is in the mind. Effects can be a great way of expressing emotions or creating textures. The Dark Side is about creating sounds and adding new tones to your symphony. Its the things you cant create with your fingers or mind. The Dark Side provides all the textures that define an essence, in one pedal. Atom The individual pieces that make up the Dark Side workstation are Fuzz, Delay and Modulation. The Fuzz side of the Dark Side is a big fuzz style distortion based on a 1977 op-amp style. Keeley used something similar in the Psi Fuzz. This one is completely and radically different. They made what seemed like endless changes to extract the nuances of earlier transistor based fuzzes. They gained it way to down to fit the time period and the style. This is a more transparent Big Fuzz. This one lets your guitar sing with sustain, yet retains the essence of you guitar whether single coil or humbucker based. The next core element in the Dark Side pedal is the Delay and Modulation side. You can select between a multi-head tape delay effect or between a combination of 4 different modulation sounds. The Dark Side delay has 12 different syncopated delays. They are rhythmic and have the tonal quality of the old spinning drum tape delays. The Dark Side has many subtle filters to get the tape delay setting to have the feel and warmth of the original machines, yet gives you range of control to have modern features like expression pedal control for the number of repeats. You can use it for creating a feedback oscillation delay. Extremely subtle modulations in the delay make it very musical. The next atom in this workstation is the modulation effect. There are four parts to this effect. Flanger, Rotary Speaker Cabinet, U-Vibe, and Phaser. You can blend between the Electric Lady Flanger and a Les-Rotary cabinet, creating new sounds. You can find that perfect blend between a vintage sounding opto-coupler based U-Vibe and the little orange phaser. There is a TRS Insert for adding effects in between the Fuzz and Modulation/Delay side of the pedal. This is handy if you have phaser or chorus pedal you might want to add if you want to use the Delay side of the Dark Side. That way you can have Fuzz>Phaser>Delay for example. There is also an Expression Pedal port on the pedal. It is highly recommended to have an expression pedal handy. You can make many adjustments on the fly that just increase the fun and functionality of the pedal while youre creating music. It has to be a TRS style expression pedal. We suggest something like the M-Audio or Moog expression pedals. Heart At the heart of the Dark Side is a hand built board that contains analog fuzz and a high quality 24-bit DSP engine. Keeley studied and analyzed decades worth of gear and crafted their own sounds that give you not only the original tones, but an endless range of in-between sounds you cant get elsewhere. Even if you have other Keeley effects or workstations, you dont have these exact sounds. The Rotary is slightly different than the Monterey, its more chorus like. The Flanger is different than the hidden one on the Bubble Tron. The U-Vibe on this pedal is also deeper and throbs with more intensity. If you were lucky enough to get one of the Jimi Hazel Phase Delays or put the Bubble Tron into the hidden bank 2 mode; well then you have heard Keeley's 4 stage phaser. Its dead on and a blast to play. Like the Monterey, this unit is completely hand built. Including the high-end DSP, everything is hand assembled and soldered by Keeley's technicians with decades of experience. Attention to detail and tone at every point. What you get is a Mother Lode of effects and sounds. Necessity is the Mother of Invention. Someone needed to put all these epic sounds in one box. Theres no need to wish you were here, get out your Strat and well see you on the Dark Side. The item "Keeley Dark Side Fuzz Delay Modulation David Gilmour Pedal V2 B-Stock" is in sale since Thursday, March 16, 2017. This item is in the category "Musical Instruments & Gear\Guitars & Basses\Parts & Accessories\Effects Pedals\Multi-Effects". The seller is "theguitarstore" and is located in Seattle, Washington. This item can be shipped worldwide.